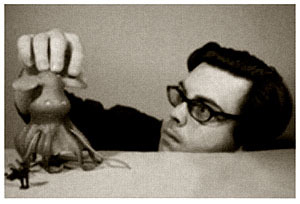 Harold worked with noted stop-motion animator Lee Baxterhaven from 1960-1963. The Wet Ones, Green Doom, and Wandering Eyes featured his clay models. Lee and Harold had a tenuous relationship...both were frequently misunderstood and temperamental artists. During the shooting of Green Doom, Haxton said something to the effect of "I don't play with dolls," to Baxterhaven, who promptly stormed off the set. To appease Lee, Haxton showed up the next day with a large teddy bear in the front passenger seat of his Studebaker. He carried the bear around the lot all day, and it sat in his director's chair while Harold served it some imaginary tea. "All with a straight face," commented cinematographer Arlen Ford. Baxterhaven found it difficult to keep his grudge after that. While filming Wandering Eyes in 1963, Haxton thought one of Lee's painstakingly carved clay models needed a bigger head. He nonchalantly spit out and added a wad of chewing gum to the creature...shooting proceeded as usual. Baxterhaven was appalled -- Wandering Eyes would be the last film Haxton made with Lee, who refused to work with him ever again. Me: "Arlen, hey sweetie, sorry to wake you...it's Marion. 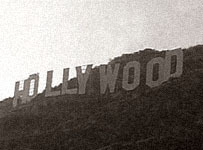 Hax is up in the Hollywood sign." Me: "Yes, he's right up there in the middle of it, drunk as a skunk." Me: "No, the 'Y'. I need you to come talk him down." It was kinda like a Laurel and Hardy routine, now that I think of it. Anyway, Arl drove up the hill in his pajamas and talked Hax down. Unfortunately, being so drunk, poor Harold wasn't able to climb down neatly...he pretty much bounced down the scaffolding like a dead monkey fallin' out of a tree.